With the constant acceleration of population growth and therefore the need to expand our towns and cities and the infrastructure that feeds them – new and upgrades to pipelines for water distribution and water storage as well as gas & oil, drainage and sewage are constantly required. 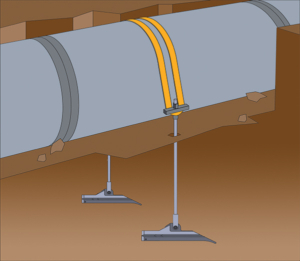 Whether you are installing a pipe for water, gas, oil or drainage & sewage – the installation method will require some form of stabilisation or buoyancy control to prevent movement which can cause damage to the pipe. 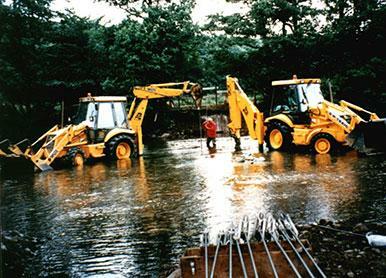 Movement can occur through several environmental conditions such as ground heave, temperature changes, vibration, change in ground conditions or the introduction of water. Our systems stabilise and tether pipes in position but do allow for a small amount of flexibility, so breakages don’t occur. Due to a larger surface area of each of our ground anchors in The Vulcan range – much higher loads are achieved than others that may seem comparable. This allows a greater load to be achieved from a smaller anchor. We also offer solutions and anchoring systems for securing of geotextiles, often required in completing pipeline projects to minimise any surface erosion until vegetation takes place. We have a friendly and knowledgeable team who can help you with any enquiry associated with the pipeline industry and will guide you through the whole process from start to finish.